Lime Rock specializes in Pinot Noir on limestone slopes in CHB. 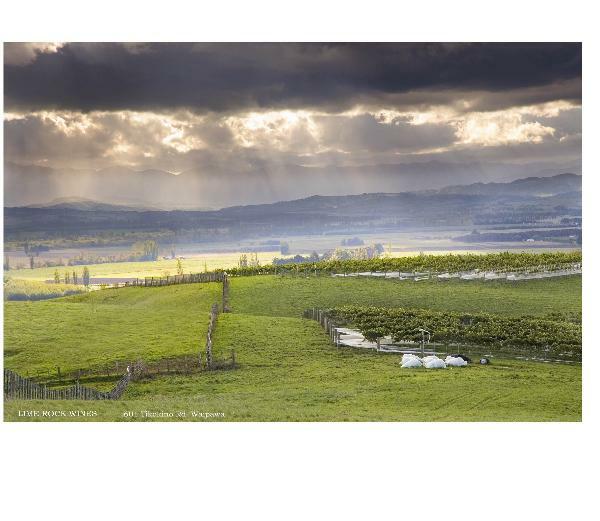 The small 10ha vineyard has spectacular views over the plains to the west and the Ruahine ranges. Other varieties include Gruner Veltliner, Sauvignon Blanc, Merlot, Cabernet Franc and Pinot Gris. Cellar door is open Saturday and Sunday 11.00am to 4.00pm November-February. Small, intimate Cellar Door experience with personal attention and staffed by the knowledgeable owners, Rodger and Rosie. We will take you on a tour of our vineyard and explain our ecology and winemaking philosophy. Taste a variety of wines and talk about our place and why we are different and special. Show you our 3 million year old oyster shells and our limestone soils. Taste our homemade bread, made by Rosie, and you will leave with a greater appreciation of imestone, Pinot Noir, Gruner veltliner and some of our wines (hopefully). Tasting and vineyard tour A trip around the hillside vineyard with the winemaker or viticulturist, in depth information, fantastic views. Followed by a tasting. All this is free!